Map from the University of Belgrade. 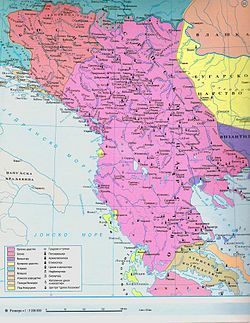 The Serbian Empire (Serbian: Српско царство / Srpsko carstvo, pronounced [sr̩̂pskoː tsâːrstʋo]) is a historiographical term for the empire in the Balkan peninsula that emerged from the medieval Serbian Kingdom. It was established in 1346 by King Stefan Dušan, known as "the Mighty", who significantly expanded the state. Under Dušan's rule Serbia was the major power in the Balkans, and a multi-lingual empire that stretched from the Danube to the Gulf of Corinth, with its capital in Skopje. He also promoted the Serbian Archbishopric to the Serbian Patriarchate. His son and successor, Uroš the Weak, lost most of the territory conquered by Dušan, hence his epithet. The Serbian Empire effectively ended with the death of Uroš V in 1371 and the break-up of the Serbian state. Some successors of Stefan V claimed the title of Emperor in parts of Serbia until 1402, but the territory in Greece was never recovered. Stefan Dušan was the son of the Serbian king Stefan Dečanski (r. 1322–1331). After his father's accession to the throne, Dušan was awarded with the title of "young king". Although this title bore significant power in medieval Serbia, Stefan wanted his younger son, Simeon Uroš, to inherit him instead of Dušan. However, Dušan had significant support from the major part of the Serbian nobility, including the Serbian archbishop Danilo, and some of the king's most trusted generals, such as Jovan Oliver Grčinić. Tensions slowly rose between the king and his son, especially after the battle of Velbužd, where Dušan showed his military capabilities, and they seem to have culminated when king Stefan raided Zeta, a province in Serbia where Dušan ruled autonomously, being a tradition of Serbian heirs to rule this province. Advised by the nobility, Dušan later marched from Zeta to Nerodimlje, where he besieged his father and forced him to surrender the throne. Stefan was later imprisoned in the fortress of Zvečan, where he died. In 1333, Dušan launched a large attack on the Byzantine empire, at the time ruled by the ambitious emperor Andronikos III Palaiologos, with the help of a deserted Byzantine general, Syrgian. Dušan quickly conquered the cities of Ohrid, Prilep and Kastoria, and attempted to besiege Thessalonica in 1334, but was prevented conquering the city by the death of Syrgian, who had been assassinated by a Byzantine spy. Syrgian was a key figure in Dušan's army, as he had earned a great reputation in Greece, convincing Greek citizens to surrender cities rather than fight Dušan's armies. By 1345, Dušan the Mighty had expanded his state to cover half of the Balkans, more territory than either the Byzantine Empire or the Second Bulgarian Empire in that time. Therefore, in 1345, in Serres, Dušan proclaimed himself "Tsar" ("Caesar"). On 16 April 1346, in Skopje, he had himself crowned "Emperor of the Serbs and Greeks", a title signifying a claim to succession of the Byzantine Empire. The ceremony was performed by the newly elevated Serbian Patriarch Joanikije II, the Bulgarian Patriarch Simeon, and Nicholas, the Archbishop of Ohrid. At the same time, Dušan had his son Uroš crowned as King of Serbs and Greeks, giving him nominal rule over the Serbian lands, although Dušan was governing the whole state, with special responsibility for the newly acquired Roman (Byzantine) lands. Tsar Dušan doubled the size of Serbian state, seizing territories in all directions, especially south and southeast. Serbia held large parts of modern Bosnia and Herzegovina, Moravian Serbia, Kosovo, Zeta, modern North Macedonia, modern Albania, and half of modern Greece. He did not fight a single field battle, instead winning his empire by blocking off cities. Dušan undertook a campaign against the Byzantine Empire, which was attempting to avert a deteriorating situation after the destruction caused by the Fourth Crusade. Dušan swiftly seized Thessaly, Albania, Epirus, and most of Macedonia. After besieging the emperor at Salonica in 1340, he imposed a treaty assuring Serbia sovereignty over regions extending from the Danube to the Gulf of Corinth, from the Adriatic Sea to the Maritsa river up to the environs of Adrianople. Bulgaria had not yet recovered since its defeat by the Serbs at the Battle of Velbazhd, and the Bulgarian tsar Ivan Alexander, whose sister Dušan married, became his vassal, between 1331 and 1365, seen just as an alliance from Bulgarian point of view. Dušan thus ruled over the almost the entire central Balkan peninsula, with only Bulgaria, southern Greece, Salonica, and Thrace escaping his authority. He gave sanctuary to the former regent of the Byzantine Empire, John VI Kantakouzenos, in revolt against the government, and agreed to an alliance. In 1349 and 1354, Dušan enacted a set of laws known as Dušan's Code. The Code was based on Roman-Byzantine law and the first Serbian constitution, St. Sava's Nomocanon (1219). It was a Civil and Canon law system, based on the Ecumenical Councils, for the functioning of the state and the Serbian Orthodox Church. In 1355, Dušan began military preparations, assembling an army of 80,000 men, an enormous number at that time. Dušan marched towards Constantinople, capturing Adrianople in a fierce battle. The Serbian army was proceeding to Constantinople, located 40 miles to the east, when Dušan suddenly died of an unknown illness at 46. His expedition ended as well, and the army retreated carrying his body. Dušan was succeeded by his son, Stefan Uroš V, called "the Weak," a term that also described the empire as it slowly slid into feudal anarchy. The failure to consolidate its holdings after a sudden conquest led to the fragmentation of the empire. The period was marked by the rise of a new threat: the Ottoman Turkish sultanate gradually spread from Asia to Europe and conquered first Byzantine Thrace, and then the other Balkan states. Too incompetent to sustain the empire created by his father, Stefan V could neither repel attacks of foreign enemies nor combat the independence of his nobility. The Serbian Empire of Stefan V fragmented into a conglomeration of principalities, some of which did not even nominally acknowledge his rule. Stefan Uroš V died childless on 4 December 1371, after much of the Serbian nobility had been killed by the Ottoman Turks during the Battle of Maritsa. Territorial evolution of Serbia in the XIII-XIV cent. The crumbling Serbian Empire under Uroš the Weak offered little resistance to the powerful Ottomans. In the wake of internal conflicts and decentralization of the state, the Ottomans defeated the Serbs under Vukašin at the Battle of Maritsa in 1371, making vassals of the southern governors; soon thereafter, the Emperor died. As Uroš was childless and the nobility could not agree on a rightful heir, the Empire continued to be ruled by semi-independent provincial lords, who often were in feud with each other. The most powerful of these, Lazar Hrebeljanović, a Duke of present-day central Serbia (which had not yet come under Ottoman rule), stood against the Ottomans at the Battle of Kosovo in 1389. The result was indecisive, but it led to the subsequent fall of Serbia. Stefan Lazarević, the son of Lazar, succeeded as ruler, but by 1394 he had become an Ottoman vassal. In 1402 he renounced Ottoman rule and became an Hungarian ally; the following years are characterized by a power struggle between the Ottomans and Hungary over the territory of Serbia. In 1453, the Ottomans conquered Constantinople, and in 1458 Athens was taken. In 1459, Serbia was annexed, and then Greece a year later. With the fall of Serbia, migrations began to the north. Serbs became mercenaries in foreign armies and fought in the irregular militias and guerrilla units of Hajduks and Uskoks within the Balkans (Habsburg Monarchy), while others joined the Hussars, Seimeni, and Stratioti. Jovan Nenad, a Serbian military commander in service to Hungary, proclaimed himself Emperor in 1527, ruling a region of southern Pannonian Plain. After finishing most of his conquests, Stefan Dušan dedicated himself to supervising the administration of the empire. One key objective was to create a written legal code, an effort his predecessors had only begun. An assembly of bishops, nobles, and provincial governors was charged with creating a code of laws, bringing together the customs of the Slav countries. Dušan's Code was enacted in two state congresses, the first on May 21, 1349 in Skopje; the second amended the code in 1354 in Serres. The law regulated all social spheres, thus it is considered a medieval constitution. The Code included 201 articles, based on Roman-Byzantine law. The legal transplanting is notable with the articles 172 and 174 of Dušan's Code, which regulated juridical independence. They were taken from the Byzantine code Basilika (book VII, 1, 16-17). The Code had its roots in the first Serbian constitution — St. Sava's Nomocanon (Serbian: Zakonopravilo) from 1219, enacted by Saint Sava. St. Sava's Nomocanon was the compilation of Civil law, based on Roman Law and Canon law, based on Ecumenical Councils. Its basic purpose was to organize the functions of the state and Church. The legislation resembled the feudal system then prevalent in Western Europe, with an aristocratic basis and establishing a wide distinction between nobility and peasantry. The monarch had broad powers but was surrounded and advised by a permanent council of magnates and prelates. The court, chancellery and administration were rough copies of those of Constantinople. The code enumerated the administrative hierarchy as following: "lands, cities, župas and krajištes"; the župas and krajištes were one and the same, where župas on the borders were called krajištes (frontier). The župa consisted of villages, and their status, rights, and obligations were regulated in the constitution. The ruling nobility possessed hereditary allodial estates, which were worked by dependent sebri, the equivalent of Greek paroikoi: peasants owing labour services, formally bound by decree. The earlier župan title was abolished and replaced with the Greek-derived kefalija (kephale, "head, master"). Commerce was another object of Dušan's concern. He gave strict orders to combat piracy and to assure the safety of travelers and foreign merchants. Traditional relations with Venice were resumed, with the port of Ragusa (Dubrovnik) becoming an important transaction point. Exploitation of mines produced appreciable resources. East-west Roman roads through the empire carried a variety of commodities: wine, manufactures, and luxury goods from the coast; metals, cattle, timber, wool, skins, and leather from the interior. This economic development made possible the creation of the Empire. Important trade routes were the ancient Roman Via Militaris, Via Egnatia, Via de Zenta, and the Kopaonik road, among others. Ragusan merchants in particular had trading privileges throughout the realm. Srebrenica, Rudnik, Trepča, Novo Brdo, Kopaonik, Majdanpek, Brskovo, and Samokov were the main centers for mining iron, copper, and lead ores, and silver and gold placers. The silver mines provided much of the royal income, and were worked by slave-labour, managed by Saxons. A colony of Saxons worked the Novo Brdo mines and traded charcoal burners. The silver mines processed an annual 0.5 million dollars (1919 comparation). East Serbia had mainly copper mines. The currency used was called dinars; an alternative name was perper, derived from the Byzantine hyperpyron. The golden dinar was the largest unit, and the imperial tax was one dinar coin, per house, annually. Serbian military tactics consisted of wedge-shaped heavy cavalry attacks with horse archers on the flanks. Many foreign mercenaries were in the Serbian army, mostly Germans as cavalry and Spaniards as infantry. 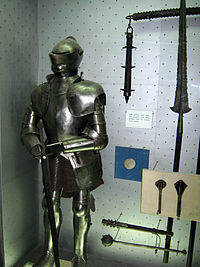 The army also had personal mercenary guards for the tsar, mainly German knights. A German nobleman, Palman, became the commander of the Serbian "Alemannic Guard" in 1331 upon crossing Serbia on the way to Jerusalem; he became leader of all mercenaries in the Serbian Army. The main strength of the Serbian army were the heavily armoured knights feared for their ferocious charge and fighting skills, as well as hussars, versatile light cavalry formations armed mainly with spears and crossbows, ideal for scouting, raiding and skirmishing. The 1339 map by Angelino Dulcert depicts a number of flags, and Serbia is represented by a flag placed above Skoplje (Skopi) with the name Serbia near the hoist, which was characteristic for capital cities at the time the drawing was produced. The flag, depicting a red double-headed eagle, represented the realm of Stefan Dušan. A flag in Hilandar, seen by Dimitrije Avramović, was alleged by the brotherhood to have been a flag of Emperor Dušan; it was a triband with red at the top and bottom and white in the center. Emperor Dušan also adopted the Imperial divelion, which was purple and had a golden cross in the center. Another of Dušan's flags was the Imperial cavalry flag, kept at the Hilandar monastery on Mount Athos; a triangular bicolored flag, of red and yellow. Flag of Serbia on the map of Angelino Dulcert (1339). Education, to which St. Sava had given the first impulse, progressed remarkably during Dušan's reign. Schools and monasteries secured royal favor. True seats of culture, they became institutions in perpetuating Serbian national traditions. The fine arts, influenced by Italians, were not neglected. Fragments of frescoes and mosaics testify the artistic level archived during this period. Influenced by the clergy, Dušan showed extreme severity towards Roman Catholicism. Those who adopted the Latin rite were condemned to work in mines, and people who propagated it were threatened with death. The Papacy grew concerned about this and the increasing power of Dušan and aroused the old rivalry of the Catholic Hungarians against the Orthodox Serbs. Once again Dušan overcame his enemies from whom he seized Bosnia and Herzegovina, which marked the height of the Serbian Empire in Middle Ages. However the most serious menace came from the East, from the Turks. Entrenched on the shores of the Dardanelles, the Turks were the common enemies of Christendom. It was against them that the question of uniting and directing all forces in the Balkans to save Europe from the invasion arose. The Serbian Empire already included most of the region, and to transform the peninsula into a cohesive whole under a rule of a single master required seizure of Constantinople to add to Serbia what remained of the Byzantine Empire. Dušan intended to make himself emperor and defender of Christianity against the Islamic wave. For a list of magnates, feudal lords and officials, see Nobility of the Serbian Empire. ^ a b Fine 1994, p. 309. ^ Ostrogorsky 1956, pp. 468. ^ Steven Runciman (26 March 2012). The Fall of Constantinople 1453. Cambridge University Press. pp. 37–. ISBN 978-1-107-60469-8. ^ a b c d e René Ristelhueber (1971). A History of the Balkan Peoples. Ardent Media. pp. 35–. GGKEY:69RCKY1X0FZ. ^ Kidd, (6 August 2013). Churches Of Eastern Christendom. Taylor & Francis. pp. 228–. ISBN 978-1-136-21285-7. ^ Ćirković 2004, p. 78-80. ^ Dusanov Zakonik Archived 2010-08-03 at the Wayback Machine. Dusanov Zakonik. Retrieved on 2011-04-17. ^ Fine 1994, p. 118. ^ a b c d e Perry Anderson (1996). Passages from Antiquity to Feudalism. Verso. pp. 290–. ISBN 978-1-85984-107-5. ^ East European Quarterly. 2. University of Colorado. 1968. p. 14. ^ National City Bank of New York (2002). JOM: the journal of the Minerals, Metals & Materials Society. 6. Society (TMS). p. 27. ^ Gavro A. Škrivanić (1979). Monumenta Cartographica Jugoslaviae 2. Narodna knjiga. ^ Stanoje Stanojević (1934). Iz naše prošlosti. Geca Kon. pp. 78–80. ^ Milić Milićević (1995). Grb Srbije: razvoj kroz istoriju. "Službeni Glasnik". p. 22. ^ Atlagić, M. (1997). "The cross with symbols S as heraldic symbols" (PDF). Baština, no. 8. pp. 149–158. Archived from the original (PDF) on 2013-05-21. ^ Ćirković 2004, p. 77-79. Dvornik, Francis (1962). The Slavs in European History and Civilization. New Brunswick: Rutgers University Press. Gavrilović, Zaga (2001). Studies in Byzantine and Serbian Medieval Art. London: The Pindar Press. Nicol, Donald M. (1993) . The Last Centuries of Byzantium, 1261-1453. Cambridge: Cambridge University Press. Nicol, Donald M. (1996). The Reluctant Emperor: A Biography of John Cantacuzene, Byzantine Emperor and Monk, c. 1295-1383. Cambridge: Cambridge University Press. Popović, Tatyana (1988). Prince Marko: The Hero of South Slavic Epics. New York: Syracuse University Press.